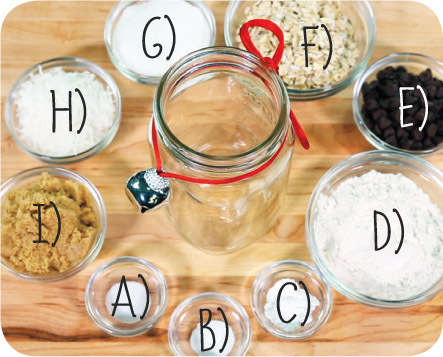 Into 1-quart (32-ounce) wide-mouth Mason jar, layer all ingredients in the order listed, packing as necessary. Seal jar, add festive decorations and a label. Don’t forget to include a recipe card! Preheat oven to 350°F. In large microwave-safe bowl, heat 1 stick butter in microwave oven on high 60 seconds or until butter melts, stirring every 30 seconds. Add 1 large egg and 1 teaspoon vanilla extract; with whisk, stir until well blended. Add contents of jar; stir until dough is moist and well blended. Drop dough by rounded measuring tablespoons, 2 inches apart, onto lightly greased cookie sheet. Bake 13 to 15 minutes or until edges are set and bottoms brown. Transfer cookies to wire rack to cool completely. 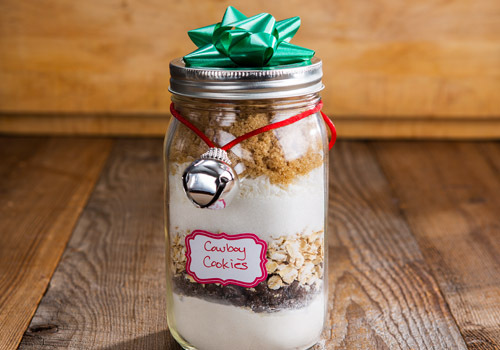 Makes about 2-1/2 dozen cookies.